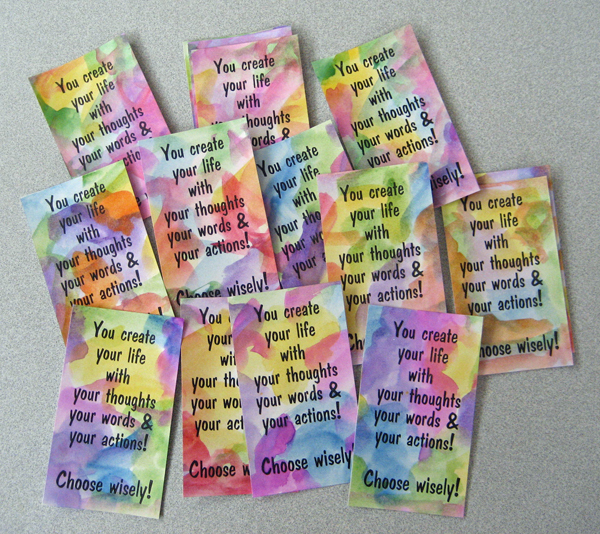 I made up these affirmation cards for a group that I hosted last week. I laser printed the words onto white cardstock and then randomly applied watercolour until I was happy with how they looked. Once they were dry, I cut them apart and pressed them under weight to help them lay flat. They would make great book marks or can be tucked on a shelf or near the bathroom mirror as a daily reminder to choose wisely. It behooves us to remember that we have creative power and that what we think, say and do affects our experiences and the process of our lives. Fear creates a much different life than does love. We get to choose! !